The "arthropod head problem"--the question of defining homologies in the cephalic segments across phylum Arthropoda--is one of the most controversial topics in arthropod biology. Consensus has accrued that the second (or deutocerebral) head segment is putatively homologous in all arthropods. This homology statement is based on (1) the location of the deutocerebrum (the second part of the arthropod tripartite brain) in the second head segment, and (2) the expression of all Hox genes surveyed posterior to the deutocerebral segment. Schematic of arthropod heads in dorsal view. Top row: Chelicerata. Bottom row: Mandibulata. Blue icons indicate structures of the arthropod brain, the protocerebrum (pc), deutocerebrum (dc), and tritocerebrum (tc). Colored rectangles indicate expression boundaries of Hox genes. Schematics modified from Giribet and Edgecombe (2012). 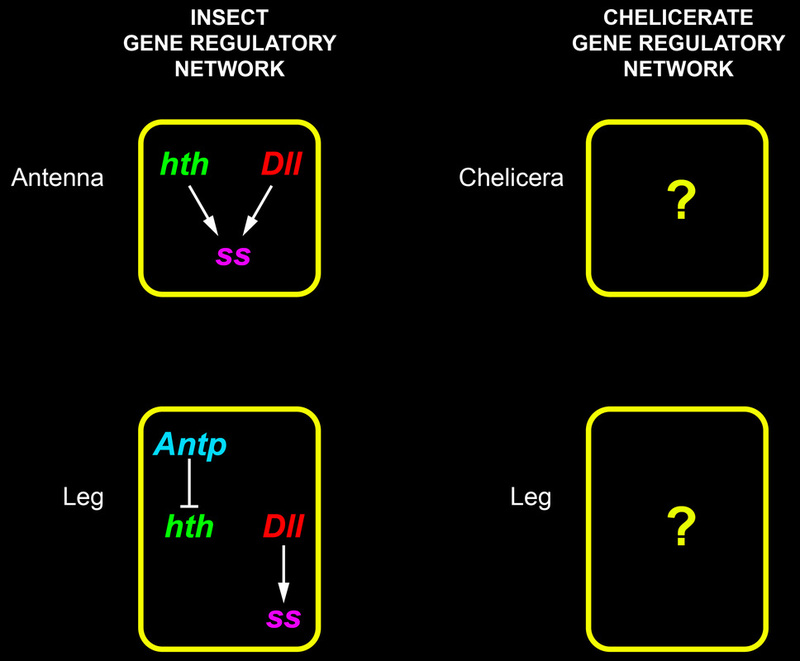 The positional homology of the deutocerebral segment implies the homology of this segment's appendage pair: the chelicera (in Chelicerata) and the antenna (in Mandibulata). This correspondence is not intuitive, due to the morphological disparity of these two appendage types. Above: The antenna of a milkweed bug (Mandibulata). 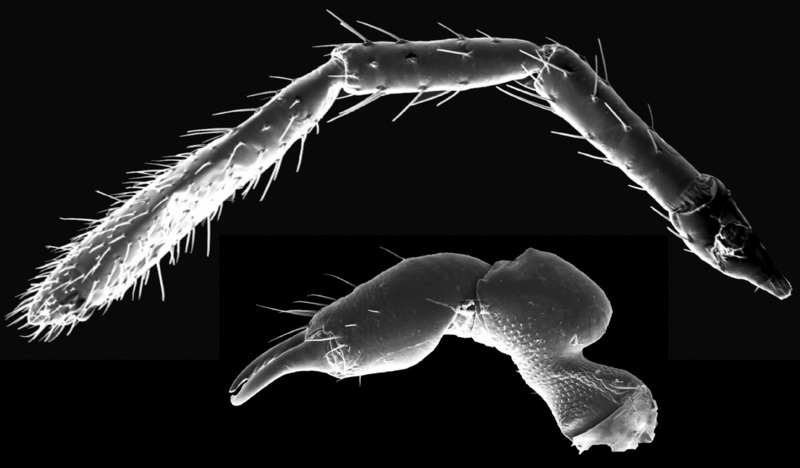 Below: The chelicera of a zalmoxid harvestman (Chelicerata). 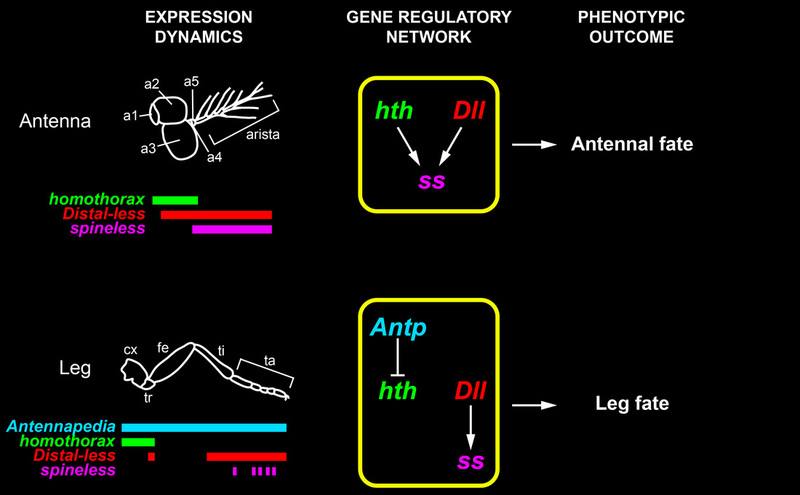 Much is known about the mechanism of antennal fate specification in the model organism Drosophila melanogaster. 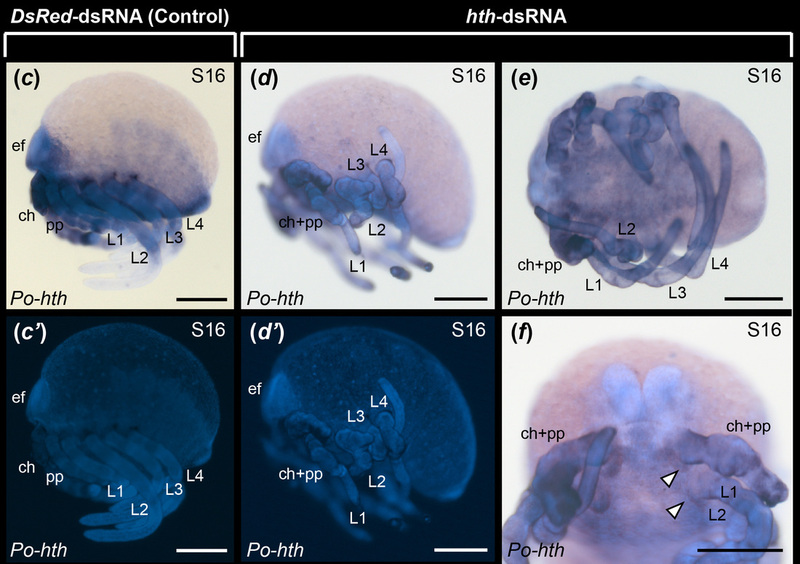 Key to antennal fate specification is the transcription factor homothorax, which has been shown to be necessary and sufficient for specifying antennal fate in the fruit fly. 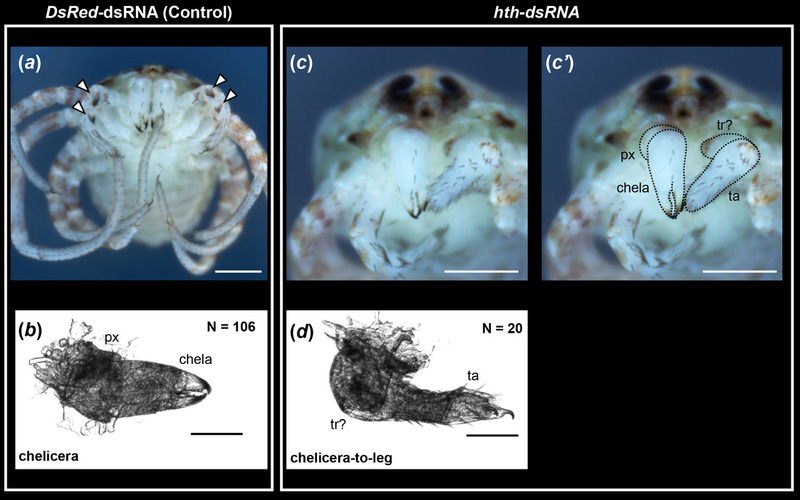 We therefore investigated whether the mechanism of deutocerebral appendage fate specification is conserved across arthropods, by examining the expression and function of the homothorax orthologs of Chelicerata. We surveyed gene expression of homothorax orthologs of a horseshoe crab, a scorpion, and a harvestman, to complement known expression patterns in spiders. Sharma et al. (2015) Proc. R. Soc. B. 282: 20150698. 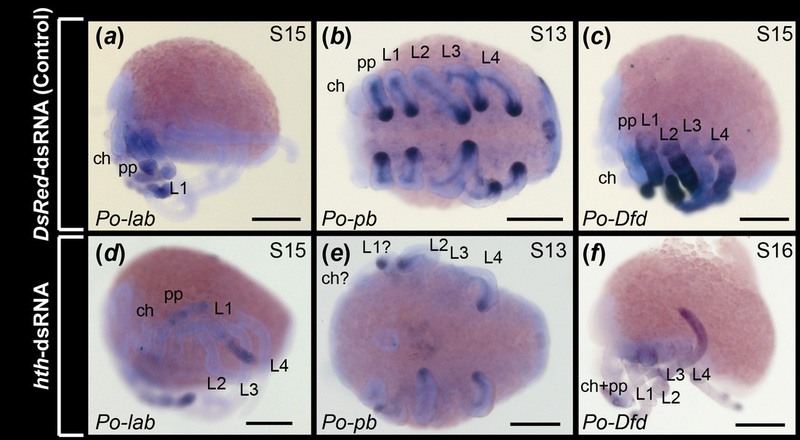 Using methods we previously developed, we knocked down expression of homothorax in the harvestman Phalangium opilio. 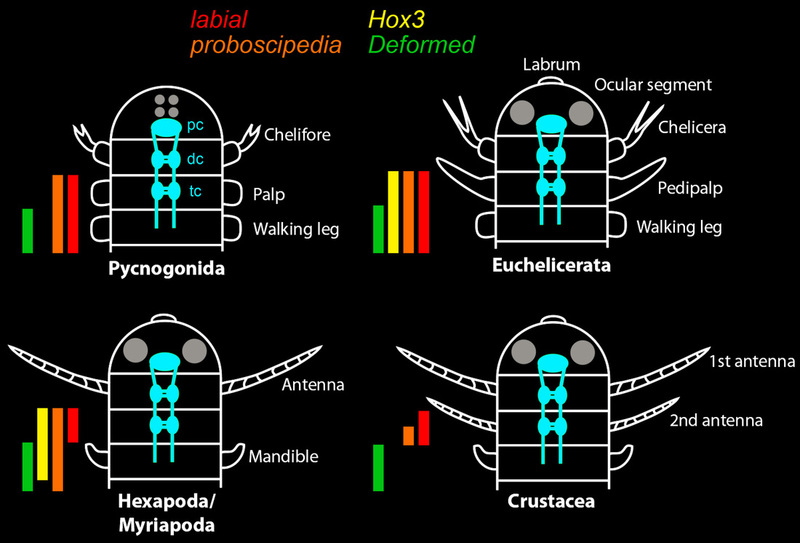 We predicted that if the function of homothorax were conserved across Arthropoda, knockdown of the harvestman ortholog would result in a chelicera-to-leg transformation (comparable to the antenna-to-leg transformation previously observed in insects). We observed a very similar range of phenotypes in this arachnid, with respect to insect model counterparts. Class I phenotypes did not survive to hatching and underwent defects in AP and PD axis segmentation. Comparably to insects (and particularly to a similar experiment in the cricket Gryllus bimaculatus; Ronco et al. 2008), knockdown of homothorax in Phalangium opilio diminished, but did not eliminate, expression of anterior Hox genes. ​Consistent with our main prediction, class II phenotypes survived to hatching and underwent homeotic chelicera-to-leg transformations. 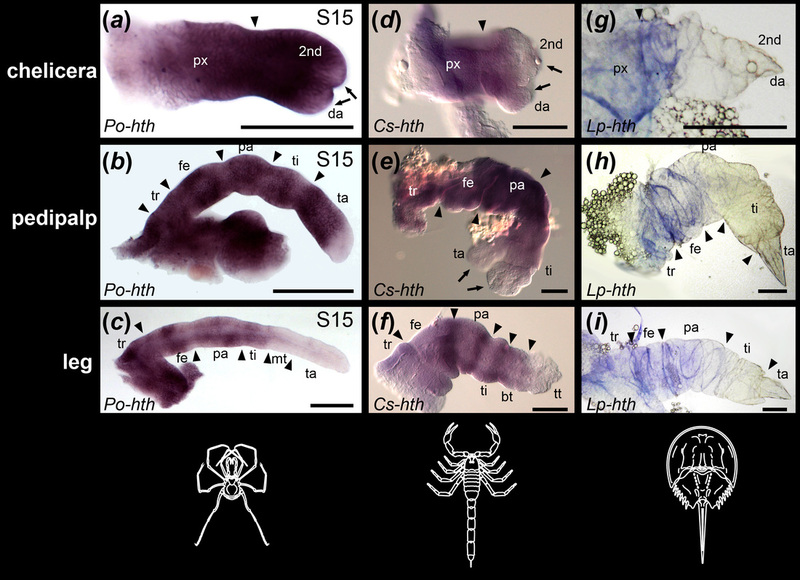 These data suggest a conserved function of homothorax in specifying deutocerebral appendage identity in insects and arachnids, and by extension, across arthropods. The identification of this conserved mechanism in turn is consistent with the putative homology of deutocerebral appendages across Arthropoda. In the figure below, arthropod orders in blue indicate availability of functional data for a homothorax ortholog.